Hi everyone.Another Thursday and another challenge for you!The weeks have flown by and it's my,Lisa's, turn to host this week.Thanks to those who joined us last time.We enjoyed looking at your wonderful entries. Just a reminder that we now run our challenges a little differently. Feel free to flip,rotate,even stretch the sketch as long as we can still recognise the basic layout. 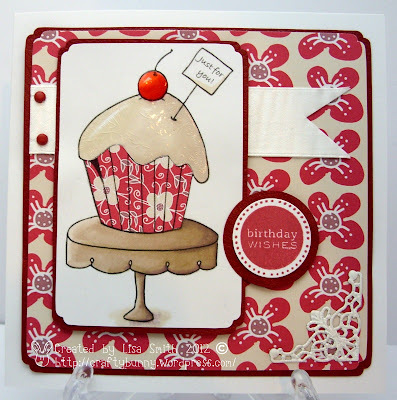 The theme is LET THEM EAT CAKE - so that means we would like to see Food on your cards. You have the choice to work with the sketch or the theme.Or if your really up for it you can combine both! Anything from your crafty stash is acceptable but we really love it when you show us something from Willow Designs. Now it's over to you to get creative.One lucky winner will receive a voucher to spend in the Willow Designs online store. You have until Wednesday 28th March 20:00 to play along with us. 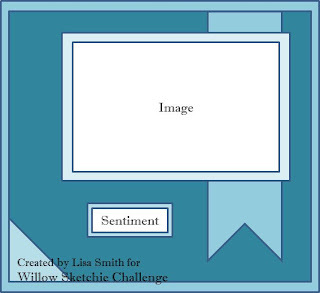 Wonderful challenge blog- great DT inspiration! Such cute DT samples! Thank you.